Home > New Treatments > Do Cholesterol Lowering Drugs Increase Cancer Risk? 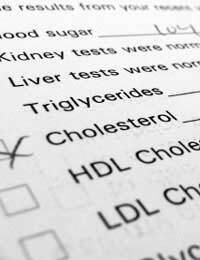 If you have high cholesterol, you are more at risk of heart disease. Unless your cholesterol is lowered you are more likely to develop atherosclerosis, commonly known as hardening of the arteries, and more likely to have a heart attack or stroke as a result. High cholesterol is a result of eating a diet that is too high in fat – which most western diets are. It is also a matter of genetics. Two people can eat exactly the same diet; one might develop high cholesterol because their genetic background makes them more susceptible. Like many diseases, heart disease risk is altered by the interaction between the environment – what you do – and your genetic background – the genes you were born with. Since the 1990s, people with high cholesterol have been given drugs that belong to the class known as statins. These reduce the level of bad cholesterol in the blood very effectively. They don’t remove good cholesterol, so the overall balance of good versus bad cholesterol improves. There are several different drugs that are part of the statin family and, generally, they are considered very safe and can be taken in the long term without having serious side effects. Although statins have been in widespread use for years that does not mean that researchers don’t stop looking into the effects they have on the body. Trials that look at the safety and long term effects of drugs after they are released onto the market are called post marketing studies. They go on for years after a drug is introduced, and collect data on hundreds of thousands of people. It is only through this type of study that some of the rarer adverse effects that are associated with relatively safe drugs are eventually discovered. This is exactly what has happened with statins during the last 5 years or so. In 2007, a study was published that showed that statins increased cancer risk. So, did that mean that all of the people whose heart disease risk was being lowered by statins now faced life without drug therapy? Well, no, not really. The study actually showed that the increase in risk, although measurable, was very small. For every 1000 patients treated with statins over a long period of time, one extra person would develop cancer who would not have done so if they had not been taking the drug. If that 1000 people had never had statins, probably quite a few more than one would have developed a life threatening form of heart disease. Risk always has to be weighed up – it is never a clear cut decision. The study released was not a clinical trial; it was a meta-analysis of 13 clinical trials that had been done several years earlier. By comparing results from several clinical trials, it is possible to see patterns that do not always become clear in one or two trials. One finding was that cancer risk was higher in patients on statins who achieved the lowest levels of bad cholesterol. Long term, high dose statin therapy was also associated with muscle wasting and effects on the liver. Overall, the results did not show that statins were or are unsafe. It was just important new information to allow doctors to make the best decisions. It suggested, for example, that slightly less aggressive statin therapy might be the ideal – lower doses to reduce the cholesterol more gradually. At the beginning of 2010, another new study was released, again a meta-analysis looking at 13 trials, which showed that using statins increased someone’s risk of developing diabetes by about nine per cent. So, if 255 people took statins for a four year period, there would be one extra case of diabetes. This is more of a risk than cancer, if these rough benchmarks hold true. Again, the study still concluded that taking the statins was still safer for overall benefit as, during those four years, 5 of the 255 people would have died of heart disease if they had not had access to statins.